Earn $10.19 in VIP credit (1019 points)What's This? 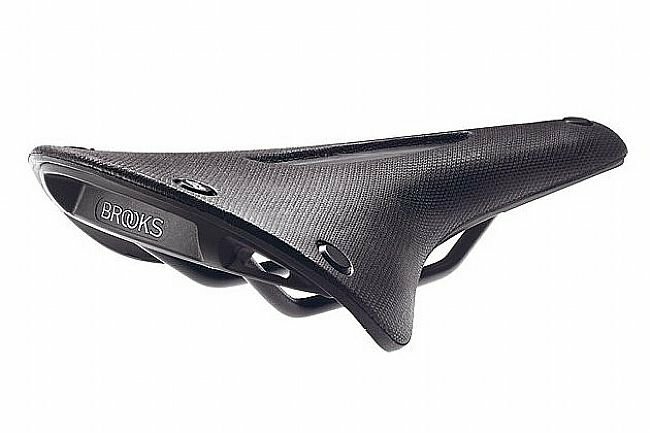 Brooks' C17 Cambium Carved All Weather Saddle treads new ground for the esteemed manufacturer of classic leather saddles, well-known for saddles that last a lifetime and go the distance. The C17 Carved is just as comfortable, durable, and handsome as the beloved B17, but it's entirely leather-free, removing the break-in period or the required maintenance of leather. This Carved version adds a cutout to the top to help relieve pressure on the perineum for further comfort and shock absorption. Made of vulcanized natural rubber for forgiving support, the All Weather version features a waterproof nylon cover for added comfort and durability, resisting rain, snow, or ice. With a shape modeled after the tried-and-true B17, the C17 will provide a superb seat for long-distance bike tourists, endurance cyclists, everyday riders, mountain bikers, commuters, and more. The fiberglass-reinforced backplate of the Cambium saddle features loops for easy mounting saddle bags, lights, or other saddle accessories. Length: 283mm. Width: 162mm. Weight: 446 grams. Put this saddle on my daily commuter and already enjoying the difference. 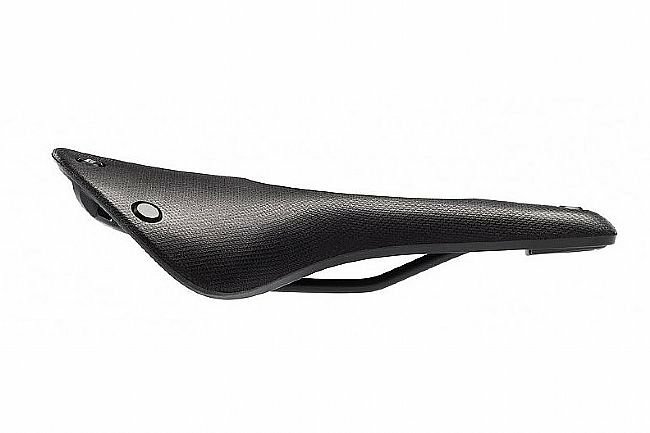 Although it is a hard saddle, the fit is excellent and the groovechannel makes it very comfortable. It flexes nicely and, although much stiffer in the cold, winter temperatures, it is still comfortable. I'm looking forward to the warmer weather to see how it feels when it has even more flexibility. As an added bonus, it looks absolutely fantastic. Good but long break in. Got this seat for my mountain bike. Must have 200 miles on it and it is finally feeling like it is breaking in. First few rides were pretty painful. Requires some patience. Comfort right out of the box. The Brooks Cambium Carved works great on my gravel bike. It's a bit stiffer than my Brooks Swift saddle, but I can tell the difference the cut-out makes on long rides. Once I became accustomed to the stiffer seat, I like it almost as well as the Swift. Much better saddle for riding trails and crossing water than the leather Brooks. Ive always loved Brooks saddles. Ive ridden the Swift, the classic B17 and now the Cambium and let me say that the Cambium by far is my favorite right out the box. The break-in time is practically non-existent and the overall ride and feel is awesome, not to mention theyre super light. Thanks Brooks, you guys are killing it. 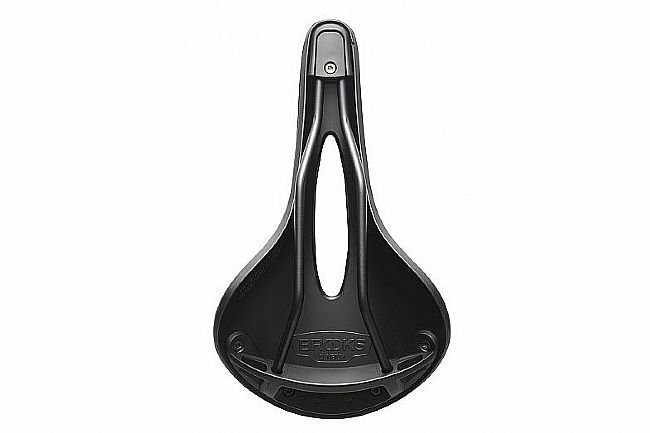 I wanted a Brooks saddle for my hybrid bike to replace the stock saddle. The Cambiun rubber construction appealed to me more than the leather. As soon as I sat on it I knew I made the right choice, very comfortable saddle and looks good too. Excellent saddle. Very happy with it and no break-in period. All weather so no worries in the rain and mud. Saddle is on a gravelcyclocross bike. I put in long rides and have a few hundred miles on the saddle. Used on gravel, single track and tarmac. It was comfortable from day one. Just a few minor angle adjustments on the first ride. Extremely comfortable on long rides. I do not notice any discomfort during or after the ride. 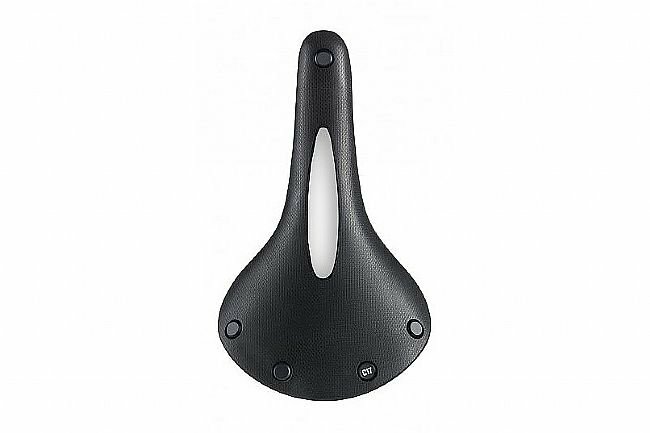 Great long distance saddle, comfortable from day 1. I bought this saddle for my wife who is a long distance cyclist. She normally rides Selle Anatomica but leather stretches and the saddle needed to be replaced. Took a chance with this model and she loves it. Comfortable on the first day and it continues to be comfortable no matter the distance. I've tried at least 15 different saddles ranging from $40 wtb to $250 selle smp. Brooks has the best feel. The saddle is quite flexible and behaves as a shock absorber. There is some break in time but nearly as much as leather, mine is starting to form after just a few rides.